This is only good for the Big Stuff - >200 sq mi. Works for the mid and lower Potomac, James, Shenandoah, Appomattox, Conococheague, Brandywine, Youghioheny, and Antietam. For the Potomac just below the dams at Barnum WV (Bloomington) and the Savage R, see the CoE's 3-day release schedules in the relevant Stream-Finder tables - #14, and #15. Add the two volumes. Or here: For Savage and Bloomington. 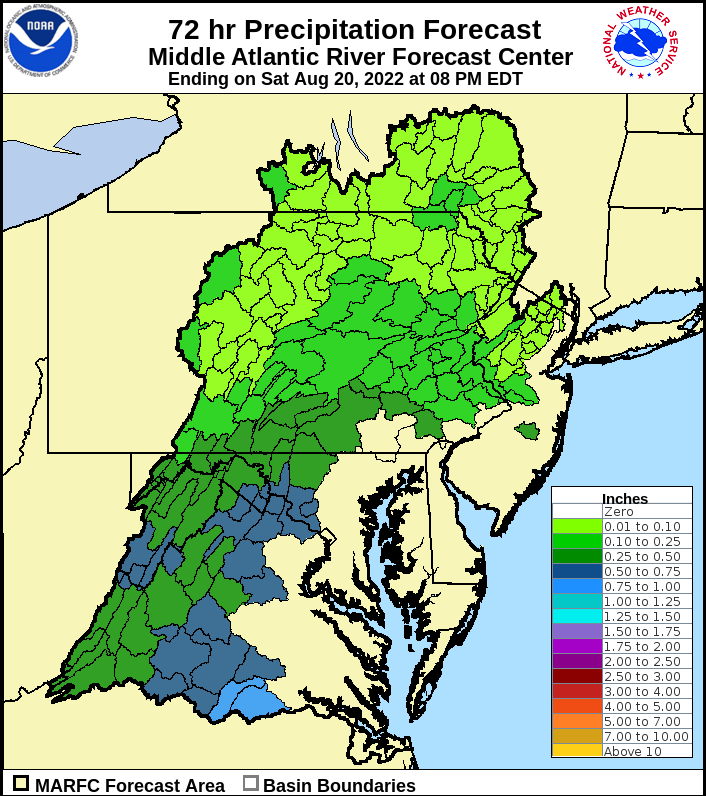 Your go-to source is NOAA’s Middle Atlantic River Forecast Center – MARFC which is the lead-in website referenced on the Monocacy Canoe Club’s River Levels page. It features a regional (Delaware River down to the Appomattox) map with (usually) green and dark gray circles and squares along the rivers on which you click to link to a hydrograph, an eight-day line graph showing the past (5 days) and predicted (2-4 days) river levels. Click on the graph’s main line to get the precise volume data in cfs. Over thirty of these sites are in our frequently-paddled area (CC&K’s two-hour radius from Washington), but it has nothing in the Tidewater or immediately NE of Washington, where the Baltimore area brooks are too short or dam-infested to make any long term prediction possible. For regional maps predicting cumulative rainfall for the next three days, with detail – breaking down those days into six-hour segments, go to MARFC's Gridded Precipitation Forecast Maps. These are subdivided into unlabeled counties, so you must know their shapes and locations. 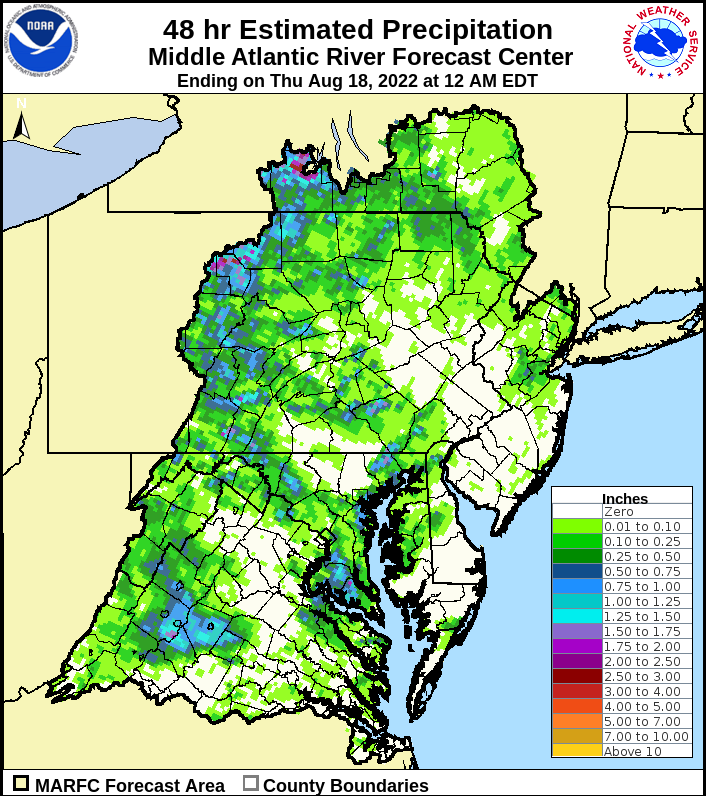 Then scroll down to the Basin Average Precipitation Forecast Maps and then to the southern MARFC Area, in the Piedmont west of Washington and below the Mason and Dixon Line – for the Potomac, Rappahannock, James, and Appomattox watersheds. Click on any of the six-hour rainfall boxes, the daily totals, or the 72-hour total to bring up a river-basin map carved into NE-SW aligned portions of river valleys colored by intensity of rainfall – ascending from light green (0-¼”) to blue, red, and orange. Again, you must know your geography, for this map has no state or county lines; however, the 40-odd basins are identified by three-letter abbreviations based on a prominent USGS gauge location (e.g., HNK, REM, DAW) in each. Some are difficult, so unlimber your imagination. On the left of the Quantitative Precipitation Forecast page – type in the nearest City and State – or zip code, and up come nine little pictures of weather happening in that town – under which is your “Detailed Forecast.” Over on the right is the Radio & Satellite Images - with the map with the Sterling Loop – and the Hourly Weather Graph - rich with wind, temperature, precipitation, relative humidity, chance of precipitation, and even wind chill data – as it says, by the hour. Pass your pointer over the chart to the time of day you want, and you will see the values also displayed below the several charts. On the chart two days worth of data are displayed – for farther into the future, above and to the left of the charts - at “48-Hour Period Starting:” click on the “Submit” button. Or at the top right, it offers tabs saying “Forward 2 Days” and “Back 2 Days.” You can also display these numbers in tabular form. Go one table below this for the vertical green bars predicting rainfall by the hour – and summing up how many inches may fall in a certain period. Or: DC-Area NWS Page - Go to for the National Weather Service office for the Baltimore-Washington area [LWX] and click on the map on the desired locale (even where there’s no town shown) for a full local (e.g., Harpers Ferry) NWS prediction. On the lower right side for each locale is an Hourly Weather Forecast Graph with detailed temperatures, wind speed and direction, and possibility of precipitation - all searchable four days in advance. Below that under “Detailed Forecast” is a prose day by day presentation of the local weather. Weather.com is very similar. A The NOAA Sterling Radar Loop [LWX], This tells current weather. Note the bar at the bottom, where you can dial up if you want your display to show counties, rivers and cities. B The Big Picture – Large CONUS Map – Mosaic Loop: Continental US What’s coming our way. This site displays rainfall in the last 3, 6, 13, 24 hours (and the past 2 through 120 days), opening with the Mid Atlantic 48 hour map. The amount of precipitation is in different colors – see the codes in the vertical bar on the right. This may obviate going to the individual (idiosyncratic and often nonexistent) state and county rainfall gauges, listed below. These are the easiest and best such gauges, as they graphically show the cumulative amounts of rainfall and precisely when it fell over the last hours or days – you set the parameters. Usually carried as an extra table at an existing USGS stream gauge, they are rare in our area, but are ubiquitous in Pennsylvania. Here are eight useful ones for the Washington/ Baltimore/ Cumberland area: Fourmile Run (Alexandria, VA), Lovettsville (N of Leesburg, VA), Markleton on the Casselmans (SW PA), Indian Rock Dam (upper Codorus, near York, PA), Chadds Ford on the Brandywine (PA + Del), Petersburg on the Potomac So Br, North Fork (WVa), and Hendricks on the Dry Fork of the Cheat (WVa). In the tables (last column) they are in bold. Drill down into your area using the “+”. Wait until it loads; counties and their names will appear. Click on any green square or triangle in your target county for further information. Click on one of the dots and a chart pops up. NOAA Forecast for PA Click on the + or - to zoom. Gives rainfall in the state. Additionally, about 100 USGS stream gauges in Pennsylvania also measure cumulative rainfall. The AFWS System in Maryland few gauges. To sign up, look below and to the right of each USGS gauge table for the “Water Alert” link. If you’re asked to enter your minimum reading not in cfs, but in feet, you’ll have to go to the two-column table for that gauge and obtain that equivalent for your desired minimum cfs figure.